a small kitchen, we've picked out our favourite beautiful small kitchens ideas. As well as injecting light and happiness into a small kitchen space, this sunny yellow floor to ceiling cabinetry maximises small kitchen storage potential. Combined with white subway tiles, this small kitchen has a surprisingly spacious feel. To achieve a similar look, try painting your kitchen cabinets by following our guide; find the best kitchen paints, too. Creating a focal point with clever kitchen lighting: pendant lighting can be an effective way of detracting from its size, while adding a stylish and sophisticated feel to a space. Suspending pendant lighting above a kitchen island is a go-to option; but above a kitchen table or (providing they don't hang too low) above a freestanding unit make great alternatives. We particularly love this stylish combination of three Dexter lights from Pooky. If you are thinking of adding a kitchen island, make sure you take a look at these clever kitchen island design ideas. While floor to ceiling kitchen cabinets are a great option for maximising storage, in excess they can make small kitchens feel boxy. Breaking up a space with open shelving is a great solution and can make an eye catching design feature if styled with pretty crockery and glassware. Find more sneaky small kitchen storage ideas. When it comes to designing a small kitchen, often it's the need for appliances that makes maximising space more challenging. Opting for slimline versions is a great solution; it not only saves space but will probably better suit your needs and decrease your energy use. We love this slimline Smeg fridge-freezer, available at John Lewis but if you are really squeezed for space check out our pick of the best under-counter fridges. Working effectively as a space enhancing colour, white should be your go-to scheme if you're looking for an easy and affordable way to make a small kitchen appear larger and lighter. However, this doesn't mean you should shy away from bold colours entirely. This bright red blind adds a real pop of colour, livening up an otherwise monochrome space. Check out these colourful kitchens ideas for more inspiration. Looking for small kitchen storage solutions in a rented home? Investing in storage boxes could be the easy, affordable and non-permenant option you're looking for. We love the versatility of Ikea's Tjena range, which provides ample storage for all of your kitchen supplies. If you are renting your home and after more tips for what you can do with your space, go and check out our renting hub page for loads of ideas. If you're redesigning a small kitchen, make sure to prioritise natural light and methods of maximising it. 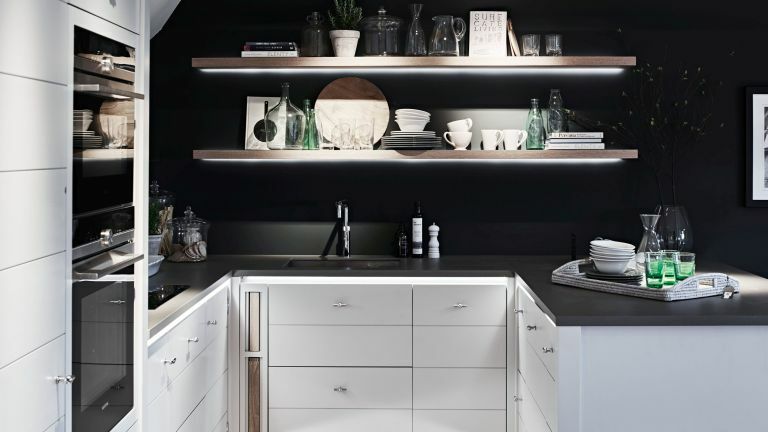 Boxy kitchen cabinets positioned around the window are sure to restrict light within the space, so opting for open shelving is an option worth considering. Inserting a sink below a window is a go-to option, with a lovely view taking the pain out of washing up (if only slightly). If you need some practical kitchen window treatment ideas then check out our guide. The process of designing a small kitchen can prove challenging, especially if the room is an unusual shape. However, fitting cabinetry, rather than going for freestanding units, will help you make the most of the room you do have. Here, kitchen cabinets have been selected that work with this tricky sloped ceiling. What would otherwise be dead space is utilised with the addition of a utensil rack. For more kitchen cabinet ideas check out our gallery. This small, but perfectly formed, Shaker-style kitchen is a great example of how having a small kitchen doesn't have to mean compromising on the features you've always wanted. Designed to house a full size Esse Range Cooker, space lost is made up with built in appliances and floor to ceiling cabinets for a high quality, considered space. Don't have space for a kitchen table and chairs? Consider opting for an integrated breakfast bar and stools instead. Adaptable spaces, they're equally suited for food preparation as they are for entertaining guests. Oh and if you are after more inspiration, check out these breakfast bar and island seating ideas. Adding bold patterns and colours into a small kitchen can be tricky and overwhelm the space. So instead of spending ages trying to choose a wallpaper that works or a paint colour that isn't too much, look to the floor for adding pattern and colour instead. We love these Laura Ashley tiles from Tile Giant, but if you after more ideas check out these stunning patterned floor tile designs. Tiny kitchen? A mirrored splashback will lighten a dark kitchen and the reflection will make the room feel much larger. Use antiqued glass for an easy-maintenance option or a period-style kitchen; go for clear mirrored panels in a contemporary kitchen.